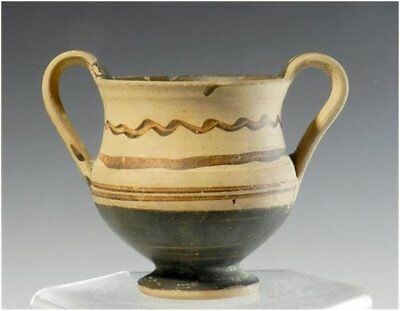 Seller: www-galleriadelvecchio-com (141) 100%, Location: Mississauga, Ontario, Ships to: Worldwide, Item: 182552369516 Ancient Terracotta Drinking Cup of Ionian Culture Stock Number: GD-502 Stunning Messapian terracotta Kantharos from circa 425 B.C. in perfect condition with some lime particles and traces of mica. Lovely cream colour slip with dark brown/black geometric bands surrounding the body, handle and inside rim. Down turned rays on the outside rim and belly; all in classic Messapic style. Elegant high bellied body with wide rim and flaring foot. The strap handles are intact and flow right into the rim and belly. Height from base to top of the handle is 4.1 inches and 5.1 inches from handle to handle. Old collector number is lacquered underneath the foot. Provenance: Private Florida collection formed in the 60's. Guarantee: Should you question the authenticity of this item we will give you a full refund. 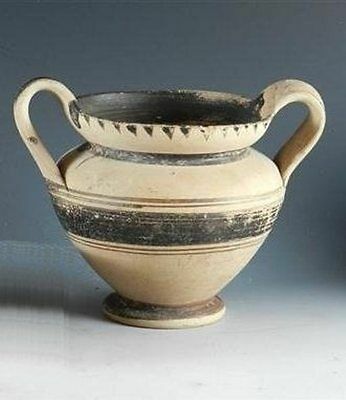 Every piece sold by Galleria Delvecchio Ancient Art is guaranteed for life. Popularity - 205 views, 0.3 views per day, 727 days on eBay. Super high amount of views. 0 sold, 1 available. 205 views, 0.3 views per day, 727 days on eBay. Super high amount of views. 0 sold, 1 available.